Injury to a muscle and/or connective tissue leads to scar tissue and reduced flexibility. Longer muscles are stronger muscles; therefore concentration on assisting the injured site to its original length or better (where possible) is paramount. Mobility and flexibility is restored progressively to the injured area with slow static stretching and PNF technique (proprioceptive neuromuscular facilitation) early in the repair phase. PNF stretching is beneficial in the acute stage of injury; not requiring the injured site to be moved to the end range of movement, therefore not impeding the healing process (time), as well as stimulating proprioceptors within muscle and connective tissue. Stretching is performed regularly following a warm-up during a rehabilitation programme. Passive stretching is introduced later in the rehabilitation process, lengthening soft tissue beyond its normal resting length by application of an external force. All stretches are explained and performed carefully to ensure safety. It is a myth that stretching prevents muscle soreness. The best time to stretch muscles is when they are warm, following exercise, returning to their original length or improve flexibility over time, helping to prevent injury. Relax! Stretch for 30-60 seconds, exhaling to relax, allowing muscles to lengthen further. Stretching should not be overly painful, although tension in the muscle being stretched should be felt. Passive (assisted) stretching allows fastest return to a rested state. Stretching on its own to improve flexibility should follow a warm up of 3-5 minutes to inform the muscle spindles the muscles are going to be used so they relax, aiding improved flexibility without risk of injury. Muscle's flexibility and range of motion is regulated by two sensory organs: muscle spindles and Golgi tendon organs. These receptors work synergistically to communicate information regarding a muscle's length and actions to our central nervous system. Muscle spindles consist of muscle fibres within the belly of a muscle. Within muscle spindles are nerve fibres with synapses at both ends that send nerve signals from one cell to the next. Connective tissues surround muscle spindles, running parallel to muscle fibre alignment. Muscle spindles send messages to our central nervous system about the length and tension of a muscle/s and the speed of contraction. When a muscle is stretched for a sustained length of time, muscle spindles become desensitised, decreasing the number of nerve signals sent to the central nervous system, allowing the muscle to lengthen further. If we stretch a muscle too quickly or too far, it reacts the same way as a seat belt; the sudden jarring jams the belt from being pulled further. We must release it before pulling slowly again. 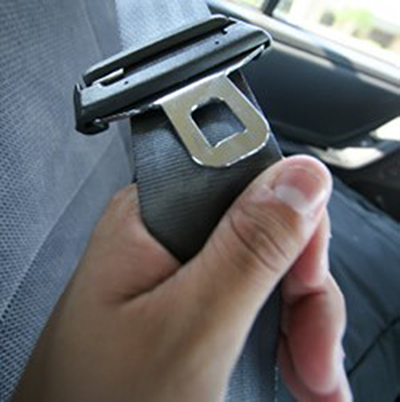 Tugging at a seat belt repeatedly only shortens it. Our muscles have a stretch reflex response that activates the same way to protect a muscle being overstretched or torn. This protective mechanism causes a muscle to become shortened and painful. Be patient when stretching (no bouncing or jerking) and for safety stretch when muscles are warm (following exercise is advised). The rehabilitation programmme below is for medial or lateral epicondylitis of the elbow. Pain experienced from gripping and flexing the wrist is probably medial epicondylitis, (bone on the inside of the elbow) itis is Latin for inflammation. Pain experienced from extending the wrist is probably lateral epicondylitis, (bone on the outside of the elbow). It is possible to experience both. Overuse can cause excessive strain to the muscles of the forearm, pulling on the tendons either on the inside (medial) or outside (lateral) of the elbow. It is actually the fascia that attaches the tendon to the bone; the fascia is a thin inelastic layer of tissue that becomes irritated. A correctly working muscle contracts or shortens, before returning back to its lengthened or resting position. Often overuse injuries and muscle strains shorten the resting position, causing pain when we try to extend to the normal resting position. Icing does temporarily reduce inflammation, although does not lengthen the shortened state. To encourage the muscle to return to its original length we must stretch; and the most effective stretch in this instance is PNF (proprioceptive neuromuscular facilitation). We must isometrically (tension without movement) contract the muscle we are stretching for a brief period (3-6 seconds), immediately followed by relaxing the muscle and progressively stretching. The golgi tendon organ is stimulated by the isometric contraction, telling the shortened muscle to relax, allowing a deeper stretch. Repeat this procedure to progressively stretch further and further. Identical at the start to the Relax and Hold Technique, although the isometric contraction is only held for about 3 seconds, relax, then contract the opposing muscle for about 3 seconds. This will use ‘reciprocal inhibition’, allowing the stretched muscle to relax as the opposing muscle is contracted, enabling a deeper stretch. Various studies disagree on the optimum time to stretch; they vary from between 1-2 minutes. Two minutes is a long time to stretch, so work up to this. These PNF techniques combined with rest and if necessary treatment (e.g. physiotherapy, acupuncture etc.) will gradually lengthen the shortened muscles, releasing the pressure from the tendon/fascia attachment, thereby dissipating the inflammation and returning back to exercise or competition sooner, with less chance or reoccurrence. N.B. These PNF stretches can be used on any shortened muscle injury. N.B. NSAIDS (non steroid anti-inflammatory drugs) such as diclofenac will help reduce inflammation and offer pain relief, although overuse increases the risk of heart attack and stroke. A natural source of anti-inflammatory and muscle relaxant without the risks is tart (montmerency) cherries, brand name cherry active (in liquid form for best bioavailability. Due to the juice being high in sugar recommended to consume post workout, when glycogen levels are low, the sugars are used solely to replenish glycogen storage rather than converted to fat). Studies Montmorency cherry juice reduces muscle damage caused by intensive strength exercise. Studies Influence of tart cherry juice on indices of recovery following marathon running. We can stretch our muscles further with a technique called myofascial release, meaning a stretch technique to desensitize tight muscles to increase their length (myo = muscle in Latin and fascial = fascia that envelops the muscle). We can trigger point (incrementally applying pressure) using a foam roller, a tennis ball, or a myofascial massage stick to compress the muscle to dissipate tenderness. The compression relaxes the muscle, allowing stretching and relaxing of the area. It is important to be patient and progressive with the myofascial release technique, otherwise it can cause a painful stretch reflex response. The protocol is to roll onto the tender area gently using bodyweight, increasing pressure as pain dissipates up to 3 times, then move onto the next area. "We Must Stretch Ourselves Daily"